With so many animation franchises content to tread water—or in one interminable case, ice—it’s seriously refreshing to see a sequel that’s not only an upgrade on the original, but more thoughtful too. 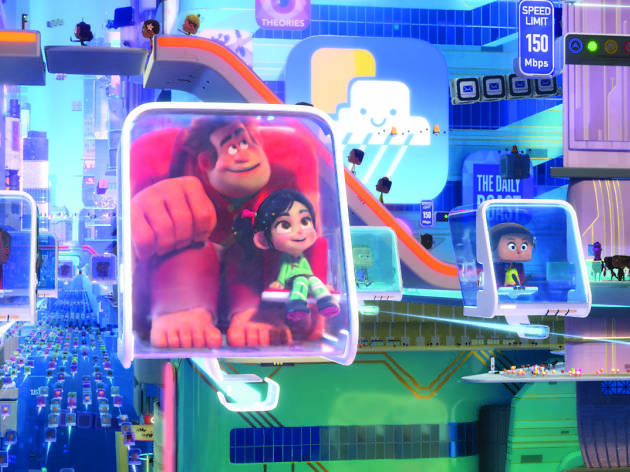 If Wreck-It Ralph launched us head-first into a 16-bit wonderland fit to blow the synapses of bright-eyed kids and weathered gamers alike, this surprisingly vibrant follow-up is a giddy, sugar-coated joy. And it’s an expansion pack that plugs in plenty of new ideas: about friendship, insecurity and the mind-bending transience of the online world. It’s not every animation that features an eBay-spoofing riff involving a corn chip shaped like Beyoncé. The story sends arcade-villain-turned-good guy Ralph (voiced by John C. Reilly) and his new BFF, arcade racer Vanellope von Schweetz (Sarah Silverman), into the internet to find a new part for her broken arcade game. Their arcade’s newly installed “wifey”, as the endearingly slow-on-the-uptake Ralph calls it, is a portal to a host of opportunities for witty visual representations of cyberspace. If it’s sometimes a touch literal—the internet is a sci-fi city filled with buildings marked “Amazon” and “IMDb” and (presumably for legal reasons) “Buzzfood”—the finer world-building is sharp. Every facet of cyberspace has a walking, talking avatar, including a patronizing search engine that notes its “autofill is a touch aggressive today,” and weasely clickbait pop-ups that are shunted aside by ad-blockers clad like burly security men. Refreshingly, the screenplay, co-written by Pamela Ribon (Moana), pulls focus from Ralph and onto Vanellope as she falls under the spell of a badass female character in a Grand Theft Auto-like game (Gal Gadot). It’s a journey of youthful empowerment and Silverman, who must have put her vocal cords on ice when she finished voicing the squeaky heroine, gives it heart and smarts. It doesn’t even need the hilarious scene with a group of earnest Disney princesses to see how she might even qualify for that pantheon. That’s not the only Disney IP to be ransacked joyously during the pair’s adventures—keep your eyes peeled for cameos from C-3PO, Groot and Eeyore, among others. It’s all funny and self-parodying enough not to feel like wanton self-promotion. Yes, that hoary quest for self-realization, running through so many animated movies, should feel tired by now. But somehow Disney keeps finding ways to keep it vital. Here, it’s via a smart riff on the highs and lows of social media that will surely resonate with kids and parents alike, as Ralph and Vanellope tumble into the angsty world of wannabe YouTube stars. It’s much more complicated than the original movie—a straightforward origin story—and the plot starts to feel convoluted at times. But Ralph Breaks the Internet deserves kudos for dipping satirically into the ephemera of viral videos, below-the-line dark-net denizens and toxic fanboy culture. It’ll probably age about as well as Tron (also paid homage to here) but it definitely feels on the mark now. Next up? Ralph Tackles the Russian Trolls. 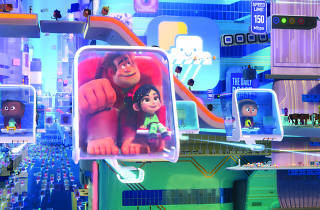 Despite having seen Wreck it Ralph I had completely forgotten the plot but luckily it really didn’t matter. This is such an imaginative iteration of what ‘the internet’ could look like and it’s one of those films where you spend most of it thinking ‘I hope they make this movie into a ride’ (... it can’t just be me that thinks about these kinds of things..?). I do think it was a bit long though, for the last 40 minutes of the film I kept thinking ‘no, this is the closing sequence’ only for the plot to twist again into another direction it might not have necessarily needed to. It makes me wonder whether it might be a bit long for the average child’s attention span as it did push the limits of mine! That being said there is a lot of great content and references here for adults and plenty of fun for kids too.